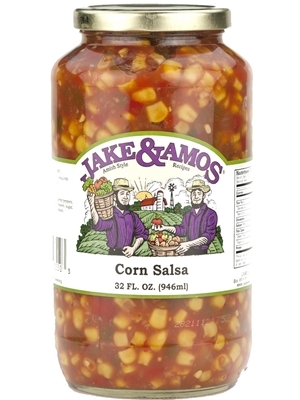 Jake and Amos Medium Corn Salsa is made with five different vegetables, including corn, tomatoes, green peppers, red peppers and jalapeño peppers. This corn salsa is rich and has a slightly spicy flavor that tastes great with any Mexican dish. Try serving this salsa over fresh baked or grilled chicken. Ingredients: Corn, Tomatoes, Onions, Sweet Bell Peppers, Tomato Paste, Sugar, Water, Vinegar, Salt, Jalapeno Pepper, Garlic, Seasonings, Celery Seed. **Manufactured in a Facility that handles: Wheat, Soy, Dairy, Eggs, Peanuts and Tree Nuts.